The award is the second in a brace of major prizes for Harvard professors this week: on Wednesday night Jasanoff's colleague Serhii Plokhy, professor of Ukrainian History at Harvard, won the £30,000 Baillie Gifford Prize for Non-Fiction for Chernobyl: History of a Tragedy (Allen Lane). 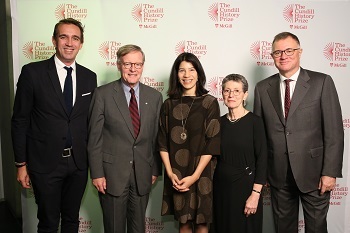 Announcing the jury’s decision at the Cundill History Prize Gala at the Montreal Museum of Fine Arts, Mark Gilbert, chair of the Jury, said: "The Dawn Watch is a striking portrait of an exceptional man and his times. Maya Jasanoff is a visitor in Conrad’s world, a recreator of it and in some ways its judge. "Capturing this world required remarkable research, an eye for telling detail, a roving spirit similar to Conrad’s own, and a gift for historical narrative. Fortunately, Jasanoff’s pen, like Conrad’s, is a magic wand." To research the book Jasanoff sailed from East Asia to Europe on a cargo ship and travelled 1,000 miles down the Congo, setting for Conrad's seminal Heart of Darkness, later filmed as Apocalypse Now. Judge and historia Peter Frankopan added: "Walking in someone else’s steps is only part of the story; the skill is working out what can be learned from doing so – and perhaps most important of all, explaining that to readers. First class historical writing requires all of these to come together; and it is a lot harder than it sounds. Jasanoff ’s book is beautifully written too. It is lyrical, evocative and haunting, and captures Conrad’s writing, personality and life perfectly. Jasanoff has tied so many strands together in such interesting ways; it really is an outstanding book by a brilliant scholar." Jasanoff is Coolidge professor of history at Harvard. She has previously been a finalist for the Cundill for her second book, Liberty’s Exile (2011), which was also shortlisted for the Samuel Johnson Prize (now Baillie Gifford Prize). Her first book, Edge of Empire, was awarded the 2005 Duff Cooper Prize. They were Caroline Fraser for the first comprehensive historical account of the life of Laura Ingalls Wilder, author of the Little House on the Prairie books; and Sam White for his investigation into the decisive role the climate played in the success, and failure, of the first North American settlements.